"Ringing in the New Year often means new eating habits. We know whole grain is important to you, and the Dietary Guidelines recommend choosing products with a whole grain listed as the first ingredient. Now every cereal with the white check has more whole grain than any other single ingredient with the same great taste. You will see "whole grain" as a part of the first ingredient on the ingredient list, indicating that whole grain is the first and most prevalent ingredient. Start Early! The Dietary Guidelines recommend people get at least 48 grams of whole grain in their daily diets. Get a jump-start on the day´s nutrition by incorporating whole grain into your morning routine. For instance, when choosing cereal make sure whole grain is listed as the first ingredient. 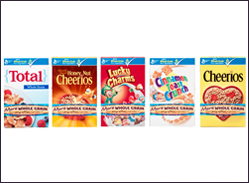 One easy choice is cereal with the white check, which have more whole grain than any other single ingredient. Make Simple Swaps. Choose whole grain versions of the foods you love. Great options include whole wheat pasta and whole wheat bread or even whole grain crackers. Also, try different types of whole grain. Use brown rice instead of white rice as a side dish at dinner or popcorn, which is a whole grain, for a snack. Don´t Judge a Food by Its Cover. The front of food packages provide good nutritional cues, but don´t forget to read the ingredients and check the nutrition label and side labels for additional health information. Cereals with the white check even include the amount of whole grain per serving on packaging. What we thought: Whole Grain Nation is awesome:) I love this idea...it makes it so easy to know what you are buying for your family is actually good for them...it takes out all the guesswork:) We eat a lot of cereal and it feels good knowing I can give my family cereals they love that are actually not loaded with sugar and that ARE full of the goodness of whole grains! ABCD Diaries gives General Mills cereals with the white check an A+! I entered the Dale & Thomas giveaway. Entered the Dale/Thomas popcorn giveaway. I entered: $20 Crate & Barrel GC + Hendrick's Gin Golf Umbrella! entered Crate & Barrel Gift Card Giveaway.. I entered the $50 Uncommon Goods Gift Card Giveaway! I entered the winners choice from Happy Green Bee giveaway! I entered the Uncommon Goods Gift Card.